When rug colors bleed, it can be a much bigger issue than the rug’s appearance being damaged. Color run can actually damage the structural integrity of the rug, necessitating major repairs for your Oriental rug in the future. Rug color restoration is a highly specialized service, so you won’t find many experts in this field. Smart Choice employs color run repair pros that you can trust to fully restore the appearance of your rug and repair any structural damage that has occurred because of the color run. Aging doesn’t necessarily decrease the value of a rug, but some clients prefer that their rug is restored to its original state. However, it may be in your best interest to partially restore a very old rug. A skilled dye master can determine what color depth would be appropriate for the rug’s age and perform rug color restoration services that will give the rug a consistent appearance and also make it look age appropriate. A professional like Smart Choice knows how to properly restore a rug so the new colors blend perfectly with the existing ones. Improper rug color restoration can actually devalue your rug, so make sure the color run repair team you choose is top-notch! Smart Choice pros are happy to educate customers about why their rug may discolor prematurely. The more you know the better you can care for your rug at home. For example, red and red-based colors are most susceptible to bleeding and fading due to the sun, while blue (and blue-based colors like green and purple) are more affected by harsh cleaners. Persian and Oriental rugs utilize vibrant colors, so your rug could be affected by more than one factor. Don’t clean it yourself, especially not with harsh chemicals. Keep it dry. Clean up spills and pet stains immediately and thoroughly. 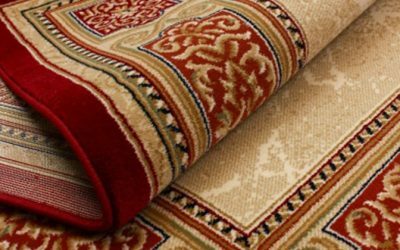 When you notice fading or color bleeding in your Persian or Oriental rug, you should have it professionally restored by a company that specializes in rug repair. Rug painting is done with a brush or airbrushing. Hand painting colors directly onto the rug is tedious and time consuming, and damage can be done with paint and chemicals if the painter doesn’t know the proper techniques and products to use. First, the rug is professionally cleaned to remove debris, moisture and stains. We can then see exactly what needs to be done to the original colors of the rug. Special equipment is used for color restoration. Smaller areas may be dyed with syringes, while larger areas may be sprayed for the best coverage. We use specially tipped air brushes to apply dyes when patterns are complex to perfectly replicate the original designs. 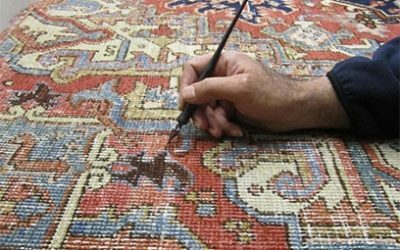 The size of the rug, the size of the area to be restored, and the techniques we must use will all determine the cost of your restoration. That’s why it is so crucial that you bring your Oriental rug in for color restoration sooner rather than later! 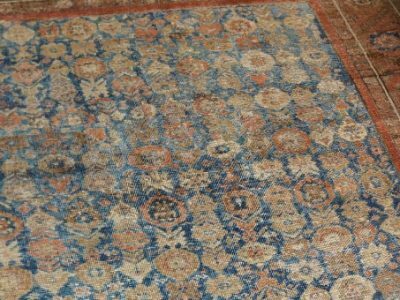 What Causes Color Loss in Persian/Oriental Rugs? Factory-made rugs made of wool or nylon are easier to dye than natural fiber rugs. Synthetic fibers like nylon are more colorfast than naturally dyed fibers like wool and silk. Fugitive dyes are natural which means that exposure to sun’s UV light causes them to run. A rug exposed to sunlight loses 1-3% of their color each year, but you won’t notice it until it has lost 10% or more of its color saturation. Using blinds or curtains in sunny rooms will protect your area rug. People sometimes try to disguise the damage with paint on their own, but the chemicals in the wrong paints can cause structural damage to your Oriental or Persian rug – and expensive rug repairs! Detergents, stain removers and other products that come in contact with your rug (on purpose or by accident) can also cause color loss. Any type of moisture can cause the darker colors to run into the lighter ones, especially if the moisture was not cleaned up quickly. Spot cleaning with room temperature water is ok every once in a while, but you have to make sure the rug is dried thoroughly. You can test for colorfastness in an inconspicuous area of the rug before exposing it to water for cleanup. Pet urine is highly acidic and can cause permanent damage to your rug. If your pet has had an accident on your rug, professional cleaning can restore its appearance and prevent rug bleeds. 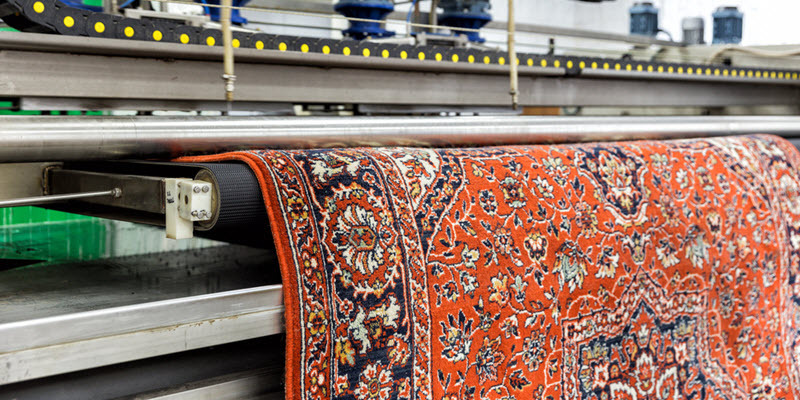 Drying is a very important part of the cleaning process of your Persian or Oriental rug! WoolSafe products are recommended by pros, but not necessarily commercial carpet cleaners or spot removers. Bleach should never be used to clean a rug! It can cause color loss and can actually damage the rug’s fibers (particularly wool and silk). Even cleaners with alkaline bleach can be very harmful to blues.